Evaluation researchers are faced with paradoxical findings on the effectiveness of treatment programs when the amount of treatment correlates negatively with outcome. For example, in a recent psychiatric study (Canfield, 1984) a negative correlation was found between the amount of time staff spent with patients and outcome. Furthermore, statistically controlling for chronicity in a multiple regression does not change the negative relationship of treatment to outcome. This means that the more staff involvement the less change the patients made and the less staff involvement than the more positive change the patients made. These are curious results when one may expect a positive correlation between amount of treatment and outcome. Further, the model of treatment reimbursement ( ) in may fields seems to demand that positive relationships be found since amount of treatment increases cost. One explanation may be that the treatment resulted in the patients getting worse, since the longer in treatment the less favorable outcome. However, another explanation might be that "effective dose" for chronic patients is more than that for acute patients. At the same time even with an "effective dose" the chronic patient is less likely to improve. Consequently, when dose size (or length of treatment) is correlated with outcome it will often be negative, even though the program might have been effective. Further, this problem will often exist in the evaluation of on‑going programs where people are continued in treatments based on their progress. Clients who have not yet recovered will most likely receive more treatment. Since it is these same people who are more resistant to treatment the correlation will be negative. It would seem that this could occur in settings such as: (1) schools, (2) training programs, (3) the legal system, and (4) medical treatment. When some psychiatric patients recover more quickly than others, the explanation may be that the more slowly recovering patient was more chronically ill. The implication is that some patients will need more treatment than others to make equal outcome gains. If patient differences (e.g., chronicity) are not included in the evaluation/research design then it is possible that no relationship will be found when in fact, a relationship may exist. Or, as in the example below, there is apparently a negative relationship but when the interaction is assessed the relationship is positive. The program could be effective but there will not be a correlational relationship because the chronic patients who received a considerable amount of treatment did not improve more than the acutely ill patients who improved with less treatment. The purpose of this paper is to show how this can be assessed by using interactions. It it first necessary to find the means and standard devaiations of STAFF and CHRON and is accomplished with the following job stream. That data is used to create the following job stream. In an psychiatric hospital daily ratings were recorded which indicated the amount of involvement of patients in various activities such as recreation, work assignments, socialization, and so forth. The rating of the degree of patient involvement with the ward staff was used as the independent variable in this example. In addition, at admission the patient completed a questionnaire which included a rating of the tension experienced during the prior week. This questionnaire was repeated 6 months later. 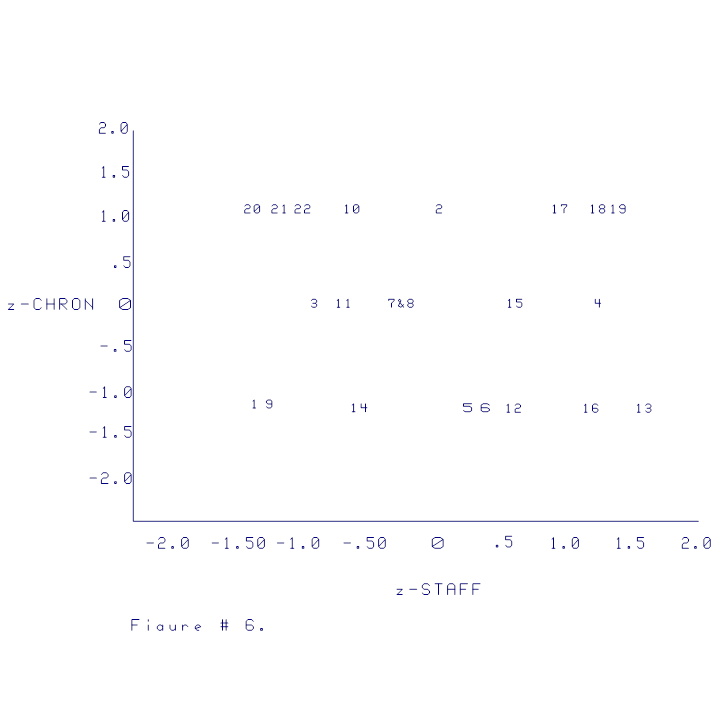 A residualized change score, as recommended by Cronbach and Furly (1970), was computed on tension scores to serve as the independent variable. A positive high score represents tension reduction between admission and follow‑up. The data for the sample of 16 patients is presented in Table 1. The first column is the patient's identification number. The second column is the reduction of tension score (outcome or dependent variable). The third column is a rating of the average daily staff involvement with the patient (treatment or independent variable). The fourth column is the z‑score of staff involvement. The fifth column indicates the number of previous hospitalizations and is used for an index of chronicity of the patient (modifier variable). The sixth column is the z‑score for the number of hospitalizations. The seventh column is the product of hospitalization z‑score and staff involvement z‑score (product vector or adjusted variable). TABLE 1. Original and z‑scores for staff involvement and number of previous hospitalizations; the product of staff and previous hospitalizations; and outcome. The correlation matrix of the independent, dependent, modifier, and adjusted variables is presented in Table 2. 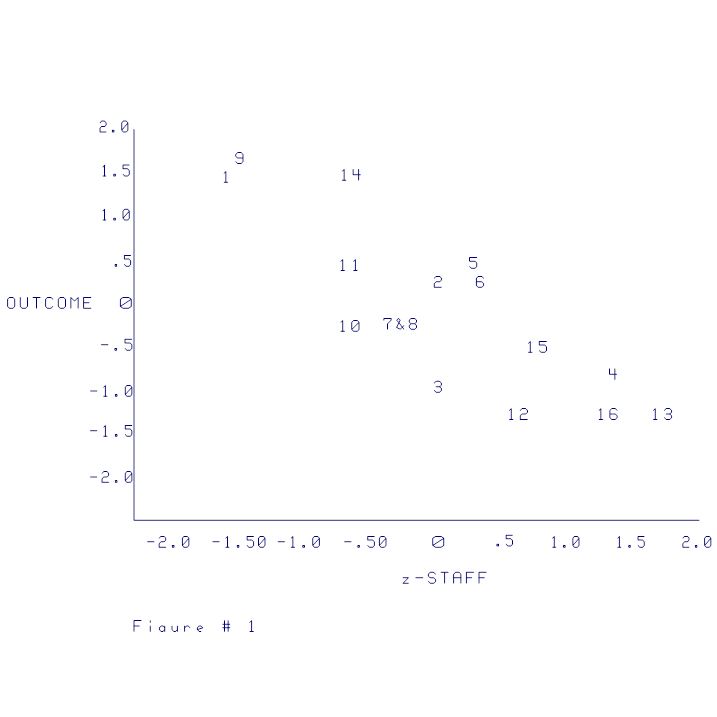 The correlation between amount of staff involvement and reduction of tension was r = ‑.82. If the modifier is entered in a linear regression equation with the independent variable, there is little increase in the multiple regression (R=.85). As indicated above this represents the dilemma because it appears that more treatment results in an unfavorable outcome. TABLE II. Correlation matrix of previous hospitalizations, staff involvement, optimized variable, and outcome. The interaction between the independent variable and chronicity explains these results. The interaction between treatment and chronicity can be calculated by multiplying the z‑ scores of the independent variable by the z‑scores of the modifier variable. The result of this is an adjusted variable which can be correlated with the dependent variable. Table 2 shows that the adjusted variable is positively correlated with the dependent variable, r=.72. 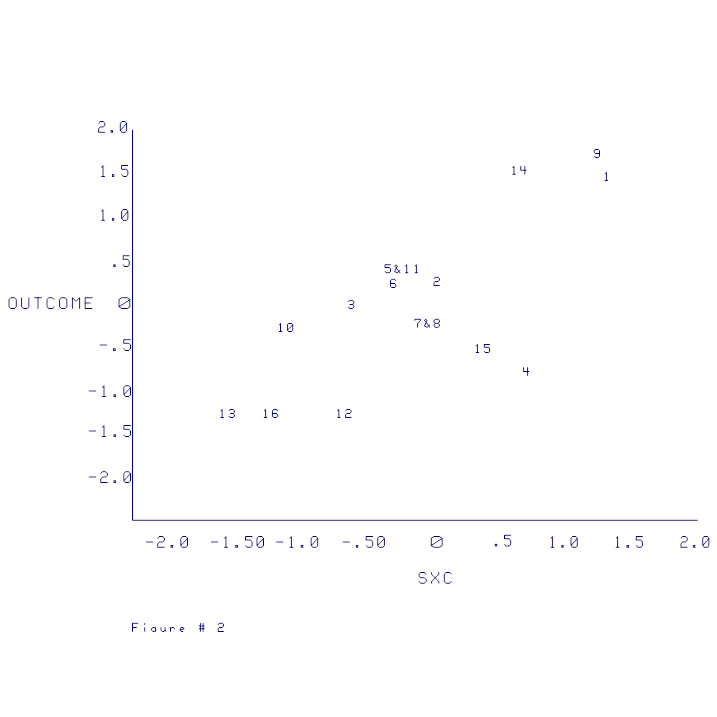 The direction of correlation has reversed from the initial correlation between the independent variable and outcome (r=‑.82). The scatterplots presented in Figures 1, 2, and 3 show how the reversal takes place and how to interpret its meaning. Figure 1 shows the negative relationship between the independent variable and the dependent variable. Figure 2 shows the positive relationship between the adjusted variable and the dependent variable. These quadrants represent patients who were well matched to the treatment. Chronic patients who needed more treatment received more treatment and acute patients who needed less treatment received less treatment. These adjusted scores reflect patients who are matched to treatment with positive (high) scores. It should be noted that this matching (or optimization) represents an hypothesis to be tested. The hypothesis is that chronic patients need more treatment than acute patients in order to make equal outcome gains. These quadrants represent patients who were mismatched to the treatment according to the theory. Chronic patients who needed more treatment received less and acute patients who needed less treatment received more. The adjusted scores reflect a mismatch in that the results are negative (low) scores. The adjusted variable, then, is an indicator of degree of optimization or matching (according to the hypothesis): a high score represents optimization while a low score represents a discrepancy. If this adjusted score is positively related to outcome then the hypothesis that chronic patients should receive more treatment is supported. The scatterplots in Figures 1, 2, and 3 and the data in Table 1 show how the data in the example data fit the adjusted scores. An acute patient (low chronicity) receiving little treatment would obtain the high adjusted score, as shown by cases 1, 9, and 14 in Figure 3. Note that these cases are in the lower left hand quadrant of the table. The z‑scores for these variables are presented in Table 1. 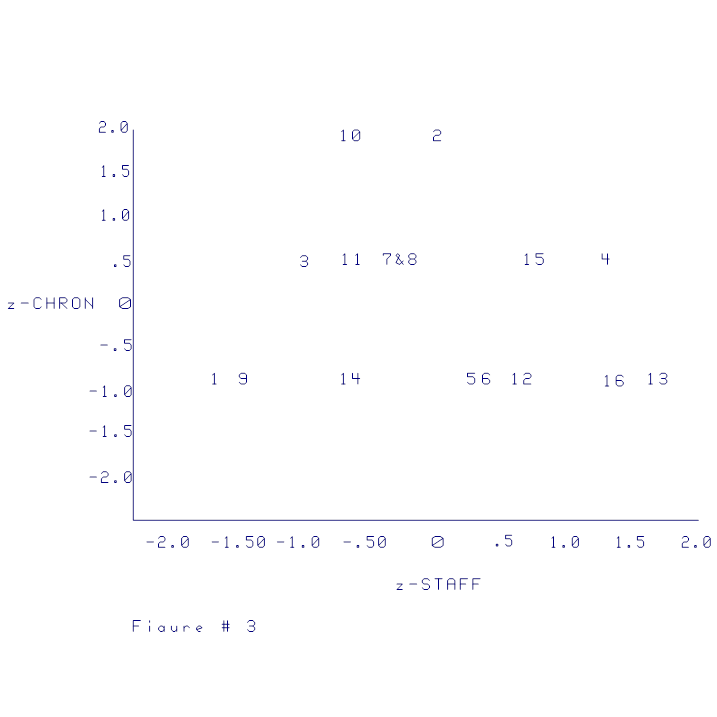 The z‑scores for case 1 are ‑1.61 for treatment and ‑.88 for chronicity. The result of multiplying ‑1.61 by ‑.88 is 1.42 a positive score on the adjusted variable. 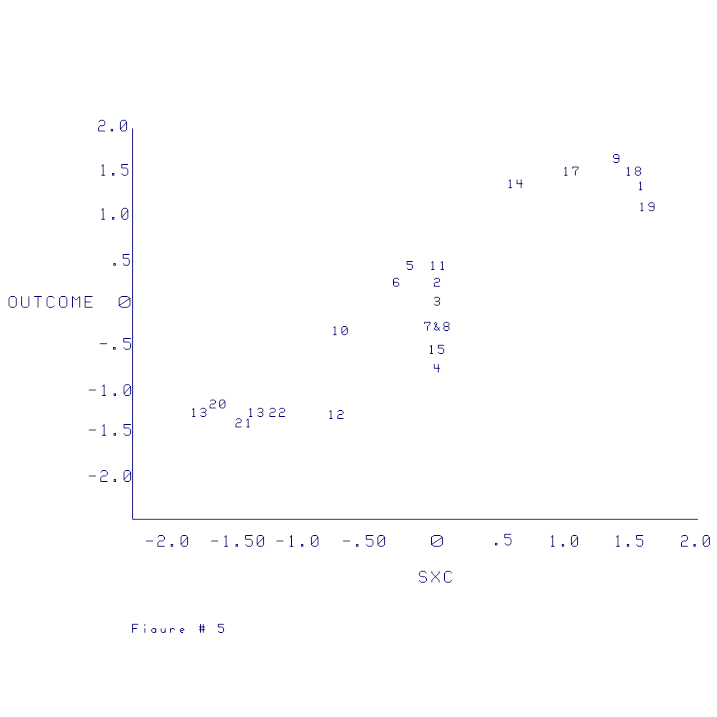 Consequently, the score changed from a high negative score on STAFF to a high positive score on the adjusted variable (SXC). The same is true of cases 9 and 14. It can be noted on the change from Fig 1 to Fig 2 that these cases change from negative to positive. Cases 16 and 13 represent a mismatch change for the adjusted score. Case 13 was positive on treatment (z = 1.74) but negative on chronicity (z = ‑.88). The result is a negative adjusted score of ‑1.52 which indicates lack of optimal treatment according to the theory. 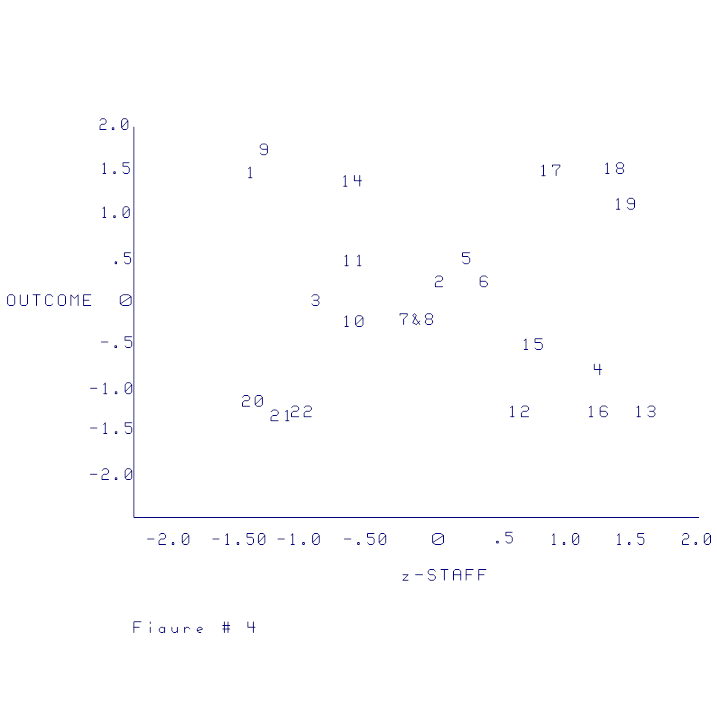 Consequently, the cases in the upper left quadrant of Figure 3 resulted in changing the positive staff scores to negative adjusted scores. This adjusted variable that represents degree of optimization can now be correlated with outcome. If it correlates with outcome, it would indicate that patients who got the appropriate amount of treatment got better and patients who did not receive the optimal treatment did no get better. It indicates that patients who were matched for treatment (chronic patients more treatment and acute patients less treatment) obtained high positive outcomes and patients who were mismatched for treatment obtained low or negative outcomes. This interaction can take place also when the original dependent variable correlates zero with the dependent variable. Six cases were arbitrarily added to the original 16 cases to show this effect. The data are found in Table 3, the resulting correlation matrix is in Table 4, and scatterplots are in Figures 4, 5, and 6. The correlation matrix in Table 4 shows that the relationship between the independent variable and the dependent variable is .00 and the relationship between the adjusted variable and the dependent variable is .91 thus demonstrating the it is not necessary for the original independent variable to be negative. TABLE III. Data with 6 cases added to show relationships. A comparison of the two sets of data also demonstrates the difference between the moderator variable and modifier variable. As noted earlier the definition of the modifier variable is defined differently than a moderator variable (e.g., Ghiselli) in that a moderator variable must increase the variance accounted for in a multiple regression. In the first example the modifier is reversed from the dependent variable (in the first example) ‑ making a considerable difference in interpretation. Both relationships are significant in the opposite direction the added variance, however, in the multiple regression only about 2% of the variance is added in the multiple regression by the addition of the adjusted variable. It can be noted in this second example that the adjusted variable would add 80% variance beyond the independent variable. So that in this instance the test of the added variance in a multiple correlation would be an adequate test of the variable. However, as seen in the previous example if the relationship is reversed (the sign changed) then the multiple regression may not detect this such a difference. This raises the issue of how the test of significance should be assessed. The method of using multiple regression to the change by adding the adjusted variable is not appropriate because it can be seen that a complete reversal if direction without significance. One possible method would be to test the difference between rxy and ray. However, that would only test the interaction and it is possible that rxy might negative while ray would be zero resulting in a significant interaction. Even though the difference is significant the zero correlation of ray indicates no relationship between the modified variable and the independent variable. Consequently, the following rules would seem to apply: (1) if the signs are opposite the ray correlation could be tested for significance beyond zero, and (2) if the signs are the same, then the method of testing the additional variance beyond the independent variable should be used.